Jet Black opens the door to mystery. Living Onelove headbands are unisex and have been constructed carefully not to slip during sport, exercise or for daily wear. 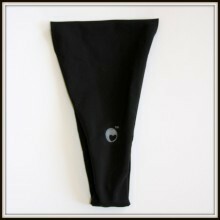 These headbands are unisex and have been constructed carefully not to slip during sport, exercise or for daily wear. These no slip, headache free headbands are tapered perfectly to sit comfortably at the neck and are very versatile. They can be worn the full width, scrunched or folded. One size fits most and are great for all ages! They wick sweat and are great under all helmets. Made in Orange County, California, USA.